The Rock is just so good at saving the world from natural disasters, falling skyscrapers, and bad guys. This time in Rampage, he saves the world from three giant monster animals in Chicago. None of the movie makes any real sense, but it sure is fun, and with The Rock and his action blockbusters, that's just fine. This Blu-ray's 1080p video transfer looks excellent most of the time, but suffers from some CGI softness. The Dolby Atmos mix is striking and loud. And the bonus features are good (although we would have liked a Rock audio commentary). Still, Rampage on Blu-ray is Recommended! We've also reviewed this movie on 4K Ultra HD Blu-ray. Special Features: Not A Game Anymore - From arcade sensation to movie monster epic, we explore how the Midway video game inspired the filmmakers to create the ultimate disaster film. Director Brad Peyton is no stranger to Dwayne 'The Rock' Johnson or action movies. The duo previously collaborated on Journey 2: The Mysterious Island and San Andreas. 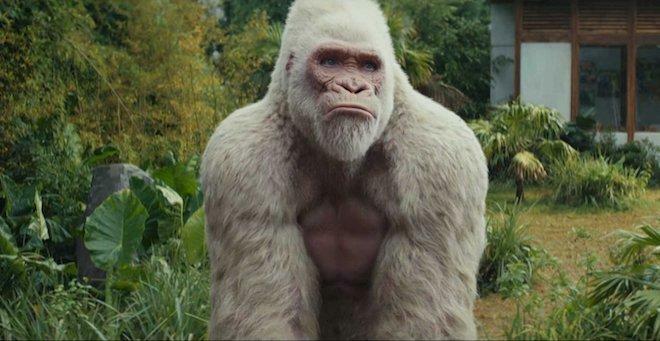 With Rampage, Peyton has The Rock save humanity, not from a natural disaster or falling rocks, but giant mutated animals, one of them being his best friend: George the Gorilla. If we can come to one conclusion by looking at movies starring The Rock, it's that he will always save the day from a cartoon caricature type of villain, while being ultra charismatic and poking fun at himself from time to time. The Rock excels at this and makes his films entertaining no matter how convoluted the plot and even when they lack thrilling dynamics. 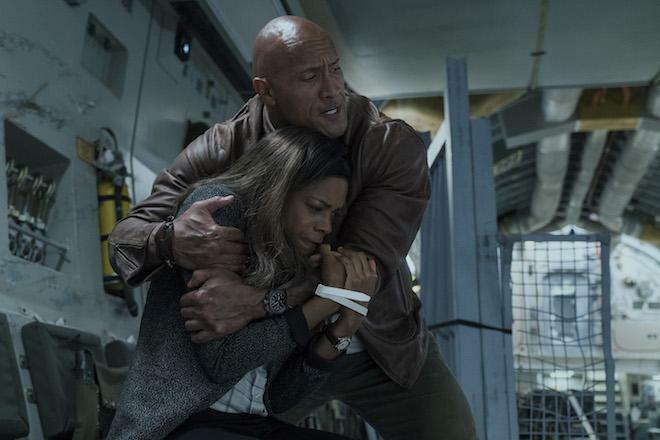 With movies like Rampage and Skyscraper, The Rock appears to be remaking every 80's action movie with modern effects, but still leaving out logic, which is completely fine here and there. Very loosely based off the old arcade game where giant monsters stampeded across a big city, The Rock stars a retired special ops military guy and now park ranger who communicates openly with his albino gorilla friend named George, whom he saved from poachers. Meanwhile, a sibling duo who runs a massive science lab has created this serum that makes animals large and super aggressive. One of these animals even managed to blow up a space station, which then hurled towards Earth with three different canisters of this serum falling in different parts of the country. A crocodile eats one, a wolf comes across another, and George finds the third. These three animals start to grow and wreak havoc, while the sinister siblings try and bring them together in Chicago to weaponize them. It's up to The Rock to get through to his gorilla friend and save the day. A movie like Rampage hinges on the quality of its actions sequences and visual effects. I'm happy to report the action is quite good and the animals look pretty good too. However, the explosions and crumbling buildings look a bit silly and the pacing is on the slow side. Even at 107 minutes, it feels long. Yet, what really works well is The Rock's willingness and charm to have fun in this role with working with motion-capture. You can tell his character is closed off to everyone but George the Gorilla, as he struggles with George's aggressive, monstrous growth. At the end of the day, Rampage still has some fun moments, as the big action sequences are quite stellar, however, much of the film falls flat, even with The Rock saving the world. Rampage comes with a 50GB Blu-ray Disc and a DVD copy of the film. There is an insert for the digital download as well as some Sony promotions. The discs are housed in a hard, blue plastic case with a cardboard sleeve. Rampage charges in with a generally excellent 1080p HD transfer that suffers from some softness during CGI-heavy sequences. Overall detail is amazing. You can see the individual hairs in George's fur, while Croc scales and Wolf fur look just as good. Actors' facial features are crisp and clean, as is their clothing. Wider shots look great too, while black levels are deep and inky, and skin tones are natural. Colors are bright with good blue skies and the well balanced white fur on the gorilla. Other greens and dirty dark colors on the crocodile and wolf look excellent. However, in scenes with lots of CGI, the imagery softens at times (worth noting: this does NOT happen on the 4K Blu-ray). George's fur becomes blurry, while explosions, crumbling buildings, and smoke effects become hazier and softer. There are also a few instances of noise. Despite a few flaws, there are no major issues, allowing the film's details and primary colors to pop off the screen in a very cinematic fashion. That said, if you own a 4K TV or are planning to upgrade, that's the best way to watch the movie. 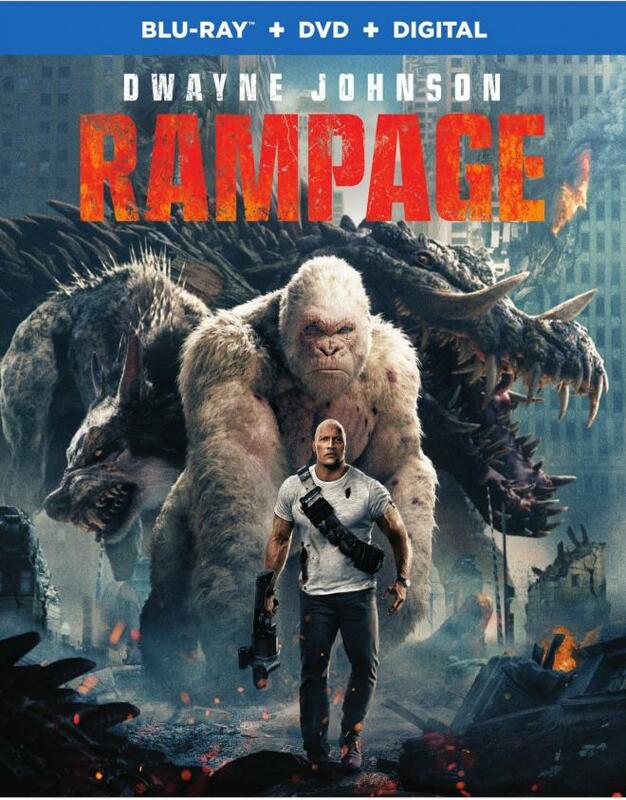 Rampage features an impressive, dynamic, and generally big-sounding Dolby Atmos track that hits all of the high and low notes needed for a big action blockbuster. Yet, it's also a track that quiets down to smaller atmospheric moments, like when The Rock and George are communicating. In these scenes, voices carry a natural reverb and softness. On the opposite end of things, the three monsters bring the noise level to an 11 with tons of height sound effects. Helicopters, planes, gunshots, and monsters wandering around all bring an intense noise to the soundscape above, and when buildings crumble, it feels like debris is raining downwards. Directionality is also impressive, be it people screaming or monsters swooping into action or bullets flying everywhere. Explosions and monster roars provide ample bass that keeps this low end running full. The score always adds to the suspense of each scene without drowning anything else out. Dialogue is clear and easy to follow along, and free of any pops, cracks, hiss, and shrills. Not A Game Anymore (HD, 6 Mins.) - Cast and crew interviews talk about their love for the old arcade game that the movie is based on, along with some information of easter eggs that are spread out through the film. Rampage: Actors in Action (HD, 11 Mins.) - This showcases all the big stunts and action sequences in the film as the actors prepare for their own stunts, which looked grueling and fun at the same time. Trio of Destruction (HD, 10 Mins.) - These are all the amazing visual effects that were utilized to bring the three monsters to life, especially in the final battle sequence. Attack on Chicago (HD, 11 Mins.) - This focuses on filming on location in the city of Chicago, which was one of the big set pieces in the film. Bringing to George to Life (HD, 12 Mins.) - This awesome extra shows us how the actor performed as a gorilla under motion capture, which is truly incredible. Gag Reel (HD, 3 Mins.) - A short montage of flubbed lines, missed cues, laughter, and mistakes on set. Deleted Scenes (HD, 10 Mins.) - 7 deleted scenes were left on the cutting room floor, none of which are needed in the final product. Rampage is a big action monster movie that stars The Rock. You know what you're gonna get -- explosions, one-liners, The Rock saving the day, and three big monsters destroying a city. Does any of it make sense? No, not really, but it's entertaining and fun. This Blu-ray's 1080p HD transfer looks good save for some soft-looking spots, but the Dolby Atmos track is phenomenal. I wish there was a Rock commentary track, but the 60 mins. worth of extras are all fun and informative. Recommended for anyone who isn't planning to upgrade to 4K in the near future.